It has been 142 days since 182 Parties to the Convention on International Trade in Endangered Species unanimously voted to ban all international trade in pangolins and their body parts and supposedly save all 8 species. It has been 52 days since the new ban came into effect, and 16 days since the last multi-tonne seizure of pangolin scales in Thailand and just one day since the government of Cameroon took to the streets to be the first to publicly burn 3 tonnes of confiscated pangolin scales in a demonstration against illegal trafficking. When a species is up-listed to CITES Appendix I, it might be easy to think that the problem is solved, that law enforcement is tightened and that trade will cease immediately, but welcome to the real world. Realistically trafficking methods become more sophisticated, traders move further underground and corruption grows. There is no doubt that the global recognition of the plight of the species is a step in the right direction but unfortunately, this is when the hard work, detecting and stopping these transnational criminal gangs, begins. December the 28th custom officers in China seized 3.4 tons of scales from a port in Shanghai. February the 2nd Thai officials seized 3'000 tons of scales worth more than $800,000. These three seizures alone (and there are so many more) are the result of approximately 11'000 - 20'000 dead pangolins (discrepancies in data due to differences in species). Just the tip of the iceberg when you realize that only 10% of trafficking cases are detected. These increases in these reports may show that law enforcement has tightened and that these shipments are now being detected where they were going unnoticed before. However, it is the size of these new seizures at crucial transit points all over the world which is particularly scary. Demonstrating the true organised nature of this illegal and highly lucrative trade. Screenshot of EIA's pangolin seizure map on their website. You can see what I mean, better visually here. Using publicly available data for this year’s World Pangolin Day, the Environmental Investigation Agency, updated their pangolin seizure map and the difference a year makes is quite sickening. You can see the original map from 2016 here ‘Happy World Pangolin day! Let's see where this EDGE species is being hunted and smuggled’ documenting all the pangolin seizure incidents across the world from 2000 - 2015. The added seizures from 2016 and the beginning of 2017 just highlights further that the scale of this illegal trade is completely unsustainable. 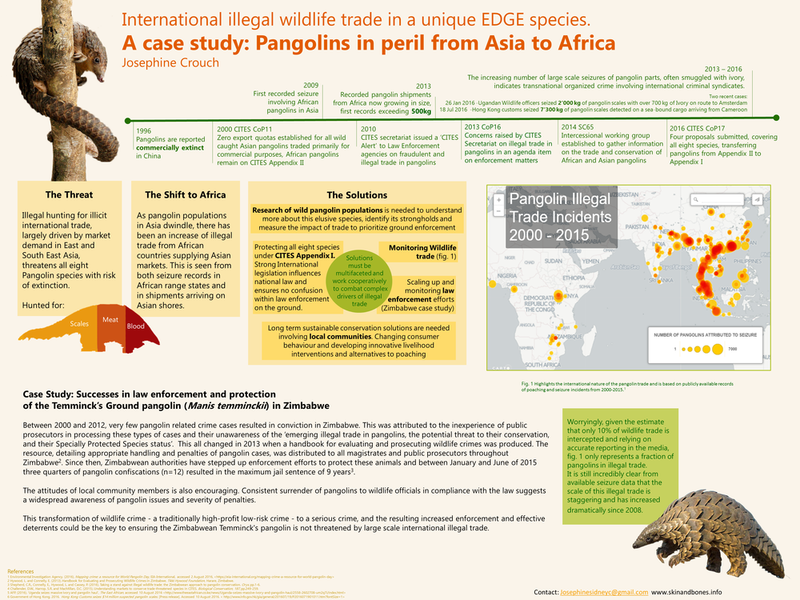 Increased trade in Africa (harvesting the 4 African species) and India (harvesting the Indian pangolin), is sadly probably due to the extinction in places of the Sunda pangolin, the Phillipean pangolin and Chinese pangolin in their natural environments across Asia. When reading articles like this it is easy to feel hopeless, but we do have solutions that work. Burning confiscated loot and growing public awareness is a start but, the fact is globally we have to up the game now, invest in law enforcement efforts, use intelligence to identify trade hubs and individual players and treat wildlife crime as a serious crime. Zhang, M., Gouveia, A., Qin, T., Quan, R. and Nijman, V., 2017. Illegal pangolin trade in northernmost Myanmar and its links to India and China. Global Ecology and Conservation, 10, pp.23-31. What do pangolins and the Fyre Festival have in common?